Exciting Rumor Alert: Is Pixar Making a Musical? “And not only that, Lee Unkrich had Toy Story 3 temped with my music and it was limiting to me. And it was fine, the movie did great and everything and maybe I’m wrong and if I look back on it I won’t know the difference, but it didn’t fit hand in glove the way I would have tried to do. And he fell in love with the temp, very much so. It’s just a throwaway line for Newman but could this be true? 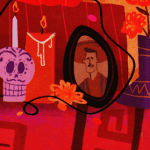 Is Lee Unkrich’s Dia de los Muertos movie a musical? We haven’t learned anything about that movie since it was announced back in 2012. And since the Pixar short film, called Lava, that will accompany Inside Out is confirmed to be a musical, maybe this was a test for the Hopping Lamp studio to see how they managed themselves in what is traditionally Disney territory. This is of course absolutely unconfirmed but we’re interested in your thoughts. Would you like to see a Pixar musical? Or do you think the more different they are from Disney, the better?